Viking’s newest ocean ship offers a heavenly experience for cruisers eager to explore. It’s a special feeling to rise from a sound sleep, slide open the door and breathe the fresh morning air from your cruise ship balcony. Gazing out each day at a new destination that promises yet another chance for exploration. In fact, Viking Ocean Cruises thinks this is such a special part of a voyage that the line’s all-balcony 930-passenger ships ensure every one of its cruisers gets that experience. This is just one feature cruisers love about Viking’s ocean ships, which have taken the industry by storm. Viking Orion launched in June 2018 as the line’s fifth ocean ship. 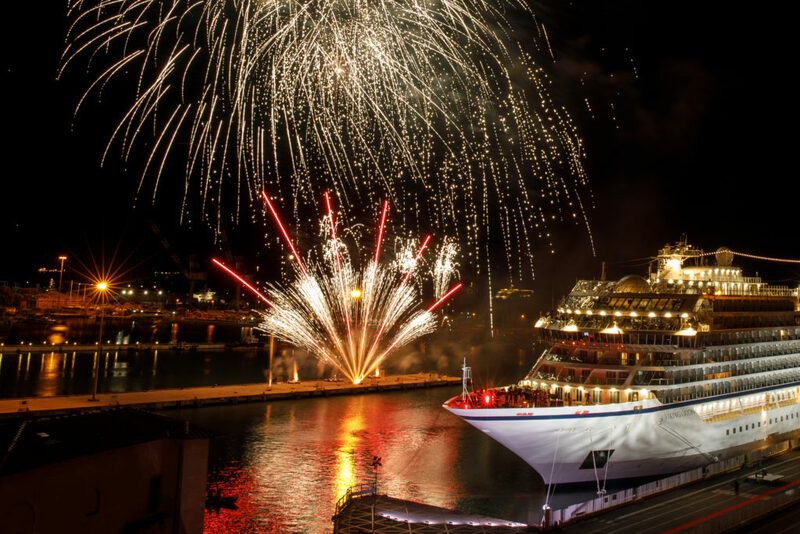 The longtime river cruise leader steered its sights toward new waterways when it launched Viking Star in 2015. Passengers have warmly welcomed these sleek ships, which have piled up top ratings and awards from review sites and travel publications. It’s full-speed ahead in the oceans for Viking, too. The line has plans for seven more 930-passenger ships, matching the uniform nature of the first five, and four more that will feature a new expedition-focused design. Viking Orion boasts spacious public areas, stylish Scandinavian-cool designs and a full array of included amenities and features, thus matching the line’s other ocean ships. 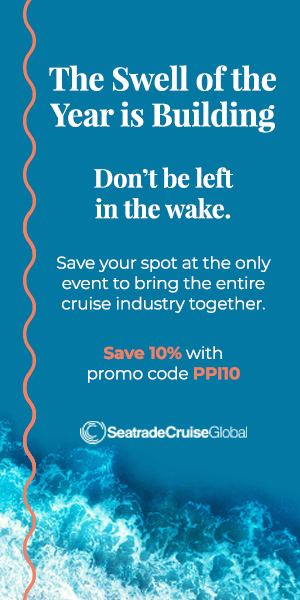 It also offers new wrinkles and distinct characteristics that point to a willingness to innovate and pay attention to even the smallest details in an effort to further refine and redefine the cruise experience. I take an embarkation-day wander through the ship, aiming to get a feel for everything aboard. On Viking Orion, this doesn’t take long. With only nine decks, I quickly find my bearings. Regular Viking Ocean cruisers will notice only small differences in colors or décor from ship to ship. This is precisely what Viking wants: a reliable small-ship experience its guests can count on. Viking Orion is for destination-focused adult travelers seeking relaxation. These ships don’t sail with kids younger than 18, and they don’t have casinos. On Viking Orion, the wide-open spaces don’t sacrifice intimacy. You’ll find calm art, peace and quiet, Scandinavian design, and comfortable staterooms with sensible touches — and those balconies, of course. “We decided to go back to traditional cruising,” Hagen says. Cabins are well appointed, with mini bars stocked to your liking (the line’s Silver Spirits package is just $19.95 per day). I choose to load up on the three varieties of Aegir, a Norwegian craft brew, that Viking stocks on ships. Bathrooms have heated floors, fog-free mirrors, and large bottles of Freyja toiletries. My bed is comfortable, and cabins offer ample spots to plug in devices — with U.S. plugs, European outlets, and USB ports. Televisions offer movies (recent releases and classics) and TV shows on-demand. The Living Room is the main hub at the center of Deck 1. With the nearby Viking Bar (with coffee and sweet treats, too), a sweeping staircase from Deck 2 and elegant couches and chairs, this is the spot to come read a book, browse the Internet (Wi-Fi is complimentary), or listen to music. A pianist or guitarist performs in the atrium, which has a small dance floor. The late-night crowd heads to Torshavn, a small club with live music and a selection of vintage Armagnacs. But my favorite place is the LivNordic Spa. This thermal suite is complimentary and features ceramic loungers, a thalassotherapy pool, hot tub, snow room, steam room, cold-plunge pool, experience showers, cold bucket, and sauna. It’s the ideal spot to rejuvenate with a traditional Nordic spa regimen after a day exploring in port. Viking Orion also offers a fitness center and spa and salon services. The Winter Garden is an indoor oasis that hosts daily afternoon tea time — a favorite for Viking cruisers. This is part of a Deck 7 complex — combined with the pool and adjacent hallway corridors — that are accented with shelves filled with books, cushioned loungers, couches, chairs, and tables. You can find places to relax indoors in a climate-controlled area or under the open sky while enjoying the small swimming pool and hot tub. It’s perpetually serene (no crowds, DJs, or pool games on this ship), and the designs represent the best Nordic understated elegance, with light woods and thoughtful touches like tiny rock and plant gardens on the tables. The Pool Grill and Pool Bar are situated nearby. The grill’s menu offers fresh-cooked burgers and specialties like the Nordic roll (shrimp stuffed onto a large hot dog), as well as a salad bar. The two-story Explorers’ Lounge is among the most-visited places. It’s warm, inviting and fabulous place to unwind at the end of busy days and after satisfying dinners. Faux animal skins are draped on couches that are arranged next to chairs to form intimate conversation areas. It features bookshelves, a large bar, fireplace, and expansive viewing windows that give panoramic vistas at the bow of the ship. At the stern is the Infinity Pool and AquaVit Terrace, where we gather nightly for pre-dinner cocktails and appetizers. A pop-up live-cooking station offers a seafood-loaded bouillabaisse and other lip-smacking delights. Passengers wade to the edge of the pool, drinks in hand, to watch the sunset as we sail away. This peaceful scene plays out at each port — from Marseille and Monte Carlo and Genoa. Cruisers fall into a dependably refreshing and relaxing rhythm. The signature element on Viking Orion that distinguishes it from the rest of the ships in the fledgling fleet is an onboard planetarium. 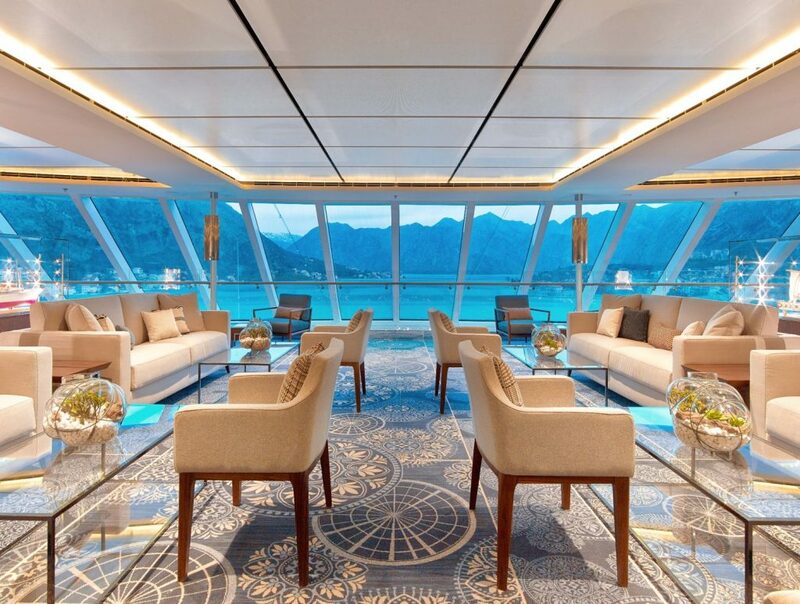 Dubbed the Explorers’ Dome, this 26-seat facility sits in the center of the second level of the Explorers’ Lounge — an exciting addition that didn’t compromise the space, said Ralph de Klijn, Viking Ocean Cruises’ executive director of operations. 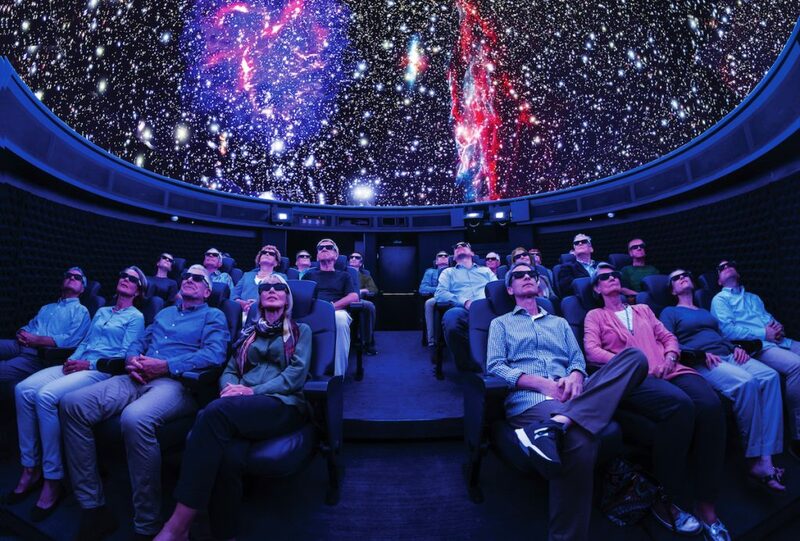 The soundproof planetarium shows full-length films that highlight exploration of our planet and the stars and galaxies above. Viking Orion sails with a resident astronomer who conducts lectures, hosts Q&A forums, and leads stargazing sessions. The astronomer can reposition the ship’s moveable telescope to capture special sky events, such as an eclipse or interesting moon phases. The system also can show feeds from special events like the landing of a rover on Mars. Cruisers may even view a shipyard or port from the perspective of the International Space Station. “The opportunities are endless,” says Howard Parkin, the astronomer who helped create Viking’s resident astronomer program. Indeed, the theme throughout Viking Orion is exploration, with an emphasis on space. The Explorers’ Dome facility is just one piece. Dozens of pictures of astronauts and other artwork depicting the celestial realms hang on the walls in hallways and other public areas. The Star Theater hosts programming centered on exploration, with enrichment talks provided throughout the voyage that highlight the places visited and the ports yet to come. Our sailing on Viking Orion offers no sea days. Most of the ocean cruises with Viking are designed with port-intensive itineraries. I set out on daily excursions after fueling up with fresh omelets in the World Café, which is the ship’s buffet, offering a diverse selection of salads, sides, fresh fish, and meats for breakfast, lunch, and dinner. Time ashore on our Mediterranean itinerary allows us to experience culture- and history-focused tours (one daily excursion is included in your fare), with free time in places like Lucca, Italy, and wine experiences in Aix-en-Provence, France. Passengers arrive back to the ship with hearty appetites, and Viking Orion delivers fine meal experiences. Viking views cuisine as a vital part of your journey, and the line works hard to marry its culinary program to the regions you visit. We dine on Italian specialties in Manfredi’s and get fresh seafood and a full array of other buffet options for more casual meals al fresco on AquaVit Terrace. A small change to the back of the World Café on Viking Orion yields a wonderful bonus you won’t find on other vessels in the fleet. Across from the aft bar, a new station serves made-to-order dishes — omelets for breakfast, pastas at lunch, and Asian noodles and soups for dinners. On our last night, we savor the slow-paced wine-pairing experience at the Chef’s Table restaurant, which features a rotating selection of five-course dinners from 13 menus offering themes like pan-Asian cuisine, Mexican, Caribbean, and even regional American foods. Viking Orion most clearly represents Viking’s vision and philosophy that a cruise ship should be the traveler’s intimate, quiet, and comfortable home base, a place to call home while exploring the sights, tastes, and unique cultures around the world. Subscribe to Porthole Cruise Magazine.